What I love about challenges is that I get to try layouts and colours combinations that I wouldn’t normally try. 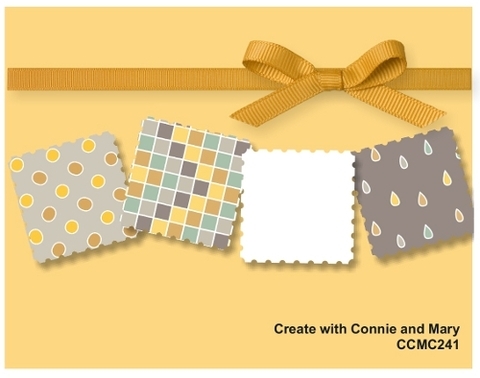 This sketch from Create with Connie & Mary is a layout that I would never have come up with myself, so I probably would never’ve made this card if it wasn’t for this great sketch! I’ve been wanting to use this gorgeous Stampin’ Up! Eiffel Tower paper since I opened the pack. I’ve never found the right sketch – until now….. As you can see I’ve really let this fabulous Fan Fair DSP do all the work on my card. The sketch worked best when I flipped it on it’s side – this way you get the full effect of the Eiffel Tower. I stamped the three images from Postage Due and punched them out with my 1 inch square punch. I then matted them with Sahara Sand cardstock punched with my Postage Stamp Punch. The fourth square is stamped with French Foliage and then I added a single flower from Stampin’ Up!s Flower Trim with some Sahara Sand leaves. I joined all four squares with Vintage Trinket brads and finished it off with a big Very Vanilla seam binding bow. We’d love for you to join us this week – head over to Create with Connie & Mary and check out the gorgeous cards the Design Team have created. Wow Narelle! This is absolutely stunning! I love everything about it. Just beautiful! Simply beautiful Narelle, what a fantastic use of the sketch. This is glorious Narelle, how like you to turn what I consider a “cute” sketch into something “Vintagey” with your spin and style, it screams YOU. Narelle, I saw this over at SC and said WOW out loud. Should have known it was your card! 🙂 Gorgeous!! Gorgeous, stunning, soft and pretty….how do you bang out one fabulous card after another, Narelle! Yours are always some of my favorites! Another beauty!! Using the dsp was so clever! Love everything about this one!! Narelle, this is ridiculously amazing. Can you mail me just a pinch of your talent? Wowzers. Wow! This is a beautiful Card. I wasn;t big on the eiffel tower, but you have made me lean towards it, Thanks! O my gosh beautifully put together Narelle love love love it ,can we do this in a card class?Is that a quad bow ? 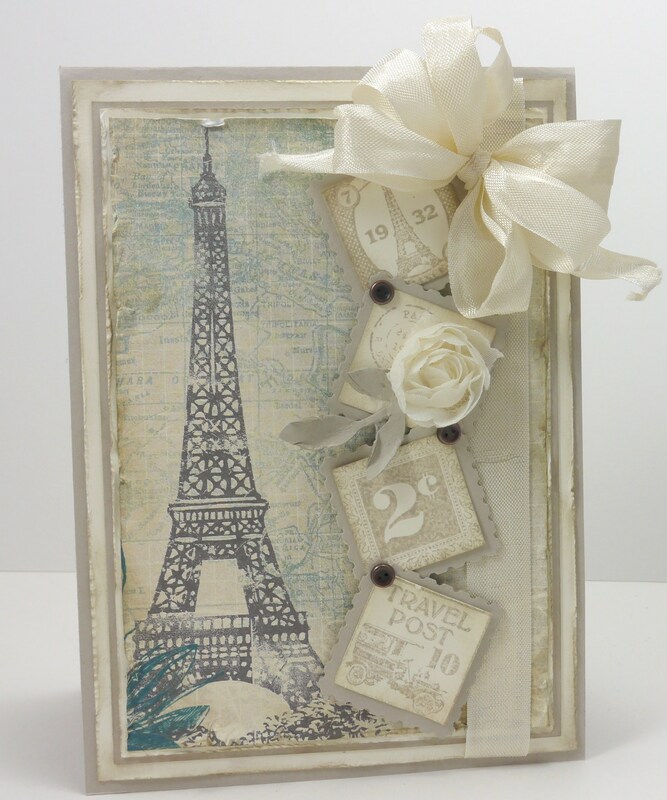 A simply stunning interpretation of that sketch, with the vintage image squares alongside the Eiffel tower. Really love how you (literally) tied them altogether with the brads. And that bow…okay, we need a short tutorial on how to make such a divine bow! Really wonderful. A heavenly beauty! This piece of art should be framed and displayed! Oh wow, oh wow, oh wow. This is stunning, Narelle. It really looks like shabby Parisian chic. Beautiful job! I think you’ve just pushed me over the edge when it comes to getting the Postage Due set LOL. Every week when you post your card I say “oh that’s my favorite so far”. You’ve done it again! Just simply gorgeous! You are the Fan Fair queen…..just GORGEOUS! Totally love this card and all the wonderful parts, colors on it. Wonderful card!!!! Wow!!! I would never thought to pair the DSP with the stamps and this sketch, but what an awesome card!!! LOVE it! This is “blow me away” gorgeous! I love how you used the DSP for you main focal point and then used the postage stamps to accent! Genius!